The topic this month (and last month) was Trees. It’s such a vast subject that several people are carrying on with it into month 3. Here are some of the books, both finished and unfinished, that people brought along today. Jane Paterson went up to Combe Wood in Butleigh and found carvings both old and new on many of the trees there. She also had made a ‘tree’ out of the leaves of a book of letters ‘of Mr Pope and several of his friends’. 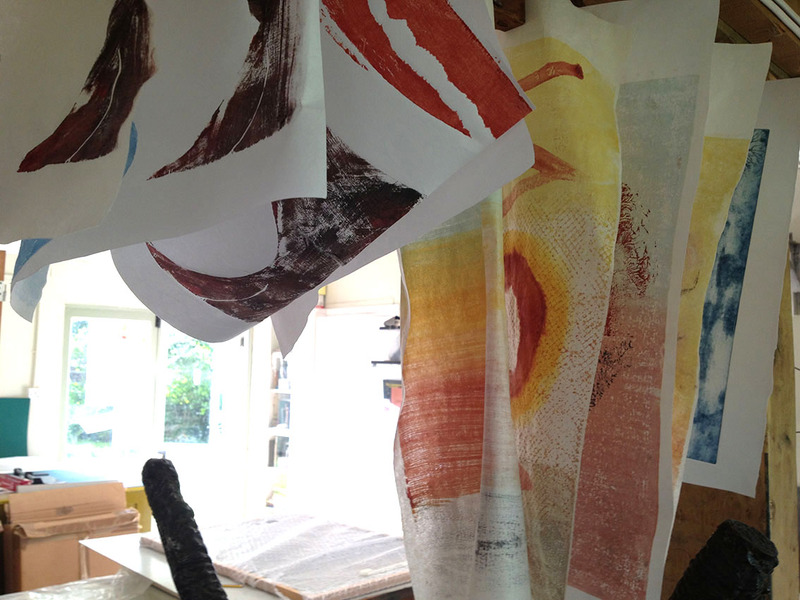 Rowena Pearce still inspired by the silver birch trees in the Mendip quarries she worked in last summer, produced a folder of water based monotypes. Janine Barchard printed photos of her favourite trees and made a simple fold book. Judy Warbey – sorry Judy, the only photo I took is out of focus – found a book in a charity shop and inserted pop up trees and poetry. Clare Diprose made prototype pop ups of the trees she had helped plant, both when they were planted (bottom) and now (top). Clare also brought along a travel sketchbook from her birthday holiday in Cricieth. This is Karen Young’s book containing trees cut out from her Christmas cards – there were a lot. Lastly, a poem by Karen’s grandson is the content of this book. We use aluminium in these courses as it is cheap, safer, and requires no solvents in its use. This will be charged at cost, as will the photo etching film and paper – cheaper or more expensive paper (Somerset Printmaking) available from the studio. All other costs are included in the general fee. NB There are some places currently available on all courses after half term (5 weeks, starting from 22 February, ending the week leading up to Easter, fee £75). The days are the same as described above, ie Mon, Tues, Wed etching.